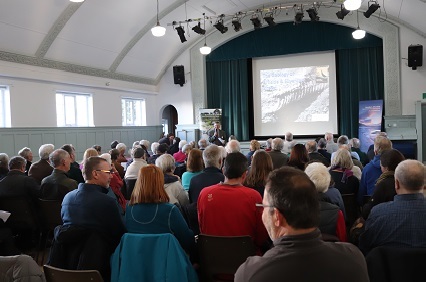 It was another packed house for the AONB Partnership’s Annual Conference which took place on 31st January at the Gaskell Hall in Silverdale. We were delighted to welcome Dr Alan Thompson and Jane Poole from Cuesta Consulting as our keynote speakers. Alan and Jane have recently completed a full audit and assessment of the geology of the AONB and the Conference presented a great opportunity to launch their ‘Geological Story’. Sylvia Woodhead from Cumbria GeoConservation, Jarrod Sneyd from RSPB and Adam Guy from Plymouth University also gave really interesting presentations on Local Geological Sites, the new Warton Mires Project and Landscape Values. “Absolutely fascinating”, “Great partnership working”, “So much fantastic information” “Absolutely informative & inspiring” – just some of the excellent feedback received.